After the maintenance on 30th April, new story missions will be added which will lead up to the finale of Wonderland's storyline. The climax of Wonderland will be arriving on 4th June. 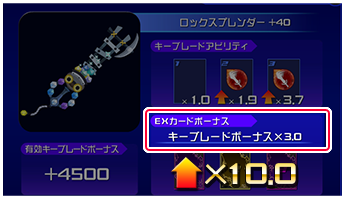 After the maintenance on 7th May, the maximum level of each Keyblade is increased to +43. A new material "Adamantite" is necessary for this, which will be available through mission rewards. Each level (+41, +42, +43) will require 20 Adamantite. Also after the maintenance on 7th May, the EX Card Bonus will also be increased from x3 to x10. After the maintenance on 21st May, the maximum level limit will be increased from 300 to 330. After the maintenance on 21st May, avatar sets that you may have missed previously will be added to the Moogle Trade Shop. After 7th May, all regular maintenance will be held on the 1st and 3rd Thursday of the month. Also on the first Thursday each month, there will be new story missions. The next story update will be on 4th June. The new Keyblades upgrades look terrific, I wonder if Level 50 will be the maximum level after all since we're seem to move in intervals of three now. I'm not surprised we will need a huge amount of the new Adamantite material though, it was pretty clear SE wants to slow the process down as far as they can since Orichalcum became so widespread. The higher EX Card Bonus bound to these new updates or is it increased in general? Also, I'm glad we will see regular story updates every month, although it would be important to know if it's a major update (new bosses, new areas, new characters etc.) or just some more filler instead. Another report without mentioning the Dungeon Mode, I wish they would tell use if it's cut or not. EX Card Bonus update will be implemented on 7th May as well. A bit rusty on the mechanics, will have to figure out how good the bonus is later on. New story missions every month, huh? I wonder how many? I'm also wondering how old an avatar set has to be before it will be added to the Mog Shop. Anyway can you help me check if the story updates are done on every last Thursday of the month so far? That's what the report said. We waited so long that it didn't felt monthly. On the other hand, there were no updates in December and February. I haven't gone further back, as I need to head off, but hopefully that helps. If anyone wants to keep checking, just scroll through this page looking for the update list at the end of every month. ...so long as KHX is in your feed, that is. As of now it looks really bad. Being in the top 1000 for all rankings in the current event will only gain you 10 Adamantites. You can't even level a single Keyblade. i got all the 4 avatar pieces in the first half of hte event, and now i have to be in the top 2000 for the finishing parts... .3. 1. Since the EX Card Bonus can be increased now there might be another multiplier mechanism in the works, which will be affected by the upgrades of level 44+. 2. They requiere synthesis materials we can not reach yet, something similiar to the Underworld water/stone/flame, only for a new part of a world (Cave of Wonders) or something from a new world altogether (Enchanted Dominion or Beast's Castle). I don't think there will be a new world coming since it should be an announcement worth mentioning in the report. Looking just on numbers, the EX Card Bonus increase should be facing the same predicament as the recent HP adjustment. +40 Starlight's Advantage Bonus = 5000 x 4 (3BP) x 10 (EX Bonus) = +200000 damage value to the card vs +60000 currently. Boss is going down faster, damage inflation is inevitable, rewards may become stingier, it is going to be a tougher fight during team battles, etc. Anyway my priority in Keyblade upgrading will be Treasure Trove -> Starlight -> Three Wishes -> Olympia -> Lady Luck. So those with magic and speed decks will have to discover the required materials on their own. I feel like .... 4th of June ? That's quite close to the 16th of June when Square makes the Conference where almost everyone expects the smartphone game to be Re:Chi or something simmilar. The conference is closer to the update on the 18th of June! That said, if KHX is ported to the west, especially if it's ported to cell phones, there won't be any need for Success Inc to do anything on their end, unless they plan on having some kind of commemorative event. They'll just pass the game off to whatever western company will be managing the game and feed them regular updates from then on, so to speak. Consider Record Keeper, which was ported to the west with many core features that weren't in the original (like Realm Synergy), and they've been running events from the original a few months behind. In a hypothetical western KHX launch, we'd probably see a launch with a subset of available missions (maybe the same as the original Japanese launch) that would rapidly catch up until syncing up. The only question I'd have is whether or not we'd see the second anniversary event, given that it would be running around that time.